Before we start talking about the best baby travel systems, let’s learn what a baby travel system is. If you want to buy an infant car seat but you are on a budget, consider shopping for a baby travel system. List of some of the best baby travel systems with good reviews on Amazon. A travel system is a popular purchase for many parents because of its convenience and cost. What is a Travel System? A baby travel system is a stroller and a compatible infant car seat that clips into both the stroller and car. Often sold in a matching set, they come in a variety of styles, prices, and quality. 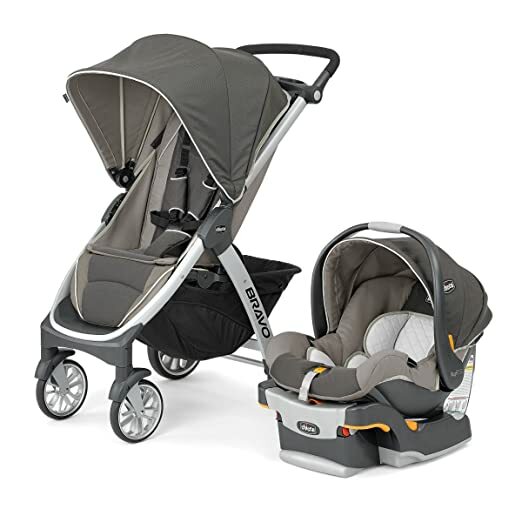 You can also create your own travel system by buying the car seat and a compatible stroller separately. Why Should I Buy an Infant Travel System? The infant car seat has a handle so that it can be used as an infant carrier. The car seat also comes with a stay-in-car base, which allows you to easily snap the seat in and out of the base for travel. The travel system is convenient for sleeping infants, since you do not need to remove your sleeping baby from the car seat. Once you arrive at your destination, you can easily snap the car seat onto the travel system stroller frame without having to disturb your baby’s sleep. Travel systems allow you to move your baby from the car to your stroller all while being strapped into the same carrier. No unfastening, moving, and refastening needed! Safety Caution – Beware of leaving your baby in the car seat for too long! A safety recommendation endorsed by all manufacturers is that you should not have your baby sitting in a car seat for more than 2 hours at a time. This includes the time when your baby is in the car and in the travel system. The car seat is not designed to take place of a crib and leaving your baby there for long hours puts them at risk for death by asphyxiation. Since small babies don’t have the strength to hold their heads up straight, their airways can be blocked. Choosing a travel system requires research and planning so that you can select the system that is best for your family. Before purchasing a baby travel system, you need to consider your needs and the baby’s needs in a car seat and stroller. Weight of the travel system – Consider the weight of the car seat because you will need to transport your baby in the car seat from the base to the stroller. Remember, you will need to add in the weight of your baby! Ease of fitting the car seat into the car – If you plan on taking your car seat in and out of your car a lot, you’ll want an easy-fit system. Look for a seat that locks easily into the car seat base and stroller. Test drive – Go to your local store and test the stroller fully loaded. Many strollers will push fine when empty but may be hard to maneuver when it’s filled with 25 pounds, after you add in the car seat, your child, and other gear you may have. Check the car seat’s expiration date – Every car seat has an expiration date, usually 5-7 years from the time the seat was manufactured. Avoid using older models that might not have the latest safety features. If you have to buy a used travel system, make sure the car seat has never been in a car crash and is not missing any pieces. Check the instruction manual to make sure your car seat doesn’t expire before your baby grows out of it. If your baby will be traveling in more than 1 car, check to see if you can buy an extra car seat base separately from the travel system. If the company does not sell separate bases, might have to buy a second car seat unless you want to install the base each time you change cars. There are also certain car seats that can be installed without the base. Check with the U.S. Consumer Product Safety Commission to ensure that the travel system you want to buy has not been recalled. The car seat that comes with a baby travel system is often an infant car seat. Your child will outgrow the infant car seat once he reaches the maximum weight limit stated on the car seat, which can range from 20-35 pounds. For the car seat, you want to choose a seat with a recline level indicator that ensures the seat of the base is at the proper angle, supporting your baby’s head and keeping his airway open. Look for a seat that has a LATCH system, which secures the seat to the car. Some car seat features that are nice to have include an easy-to-clean fabric and a comfortable carrying handle. Read more on how to buy an infant car seat. For the stroller, you will need to decide whether you want a jogger, 3-wheel, or a 4-wheel stroller. Look for a stroller with a flat-reclining seat, which will ensure that your baby can ride and rest comfortably. Some stroller features that are nice to have include a storage basket under the seat, a tray, a cup holder, and a canopy with a window that allows you to see your baby while traveling. You may also want to see if there is a removable, washable seat or liner and if the stroller is easy to fold. A travel system stroller should also have a five-point harness that is easily adjustable to keep your child secure. Should I Buy a Travel System? Travel systems are not for everyone. They are heavier than most strollers and tougher to push on uneven surfaces. Remember, a travel system is just a car seat and stroller that go together, so if you can’t find what you need, you can always buy them separately and create your own. You may like the Disney Stroller for its cute Minnie Mouse design but ask yourself if you want to be able to easily attach and detach your car seat to it. If so, you need to make sure the seat you buy is compatible with the stroller! The good thing about buying a travel system is that you just buy the safest combination set you like and not have to research strollers and car seats individually. 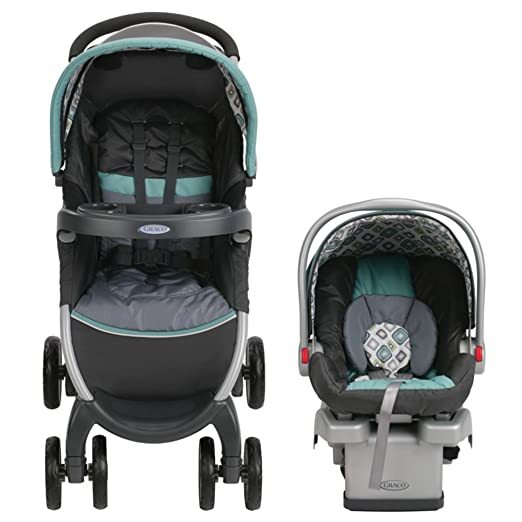 If you decide not to buy a travel system and want to place a newborn directly into the stroller, look for one that fully reclines and has leg holes that can be covered over to keep your baby from slipping out. If you want to purchase separately, here are some inexpensive infant car seats to consider. Make sure you have all the pieces when you are putting your travel system together. There may be a lot of pieces so check with the instruction manual to make sure each piece is being used for its purpose. The National Highway Traffic Safety Administration (NHTSA) has a list of safety seat inspection stations around the country where you can take your car seat to ensure it has been installed correctly. Once installed, practice clipping the car seat in and out of the car seat base and stroller even before your baby is born. This will help you get familiar so that you’re not standing in the middle of the grocery store parking lot trying to figure out how to snap your car seat into the stroller.